Utah has been known for its superlative mountain biking for some time and while our state’s beloved slickrock is famous, awesome mountain biking trails can be found within just a few miles of most of our cities and towns. From island trails surrounded by the blue waters of the Great Salt Lake, to mountain singletrack with top-of-the-world views and group-friendly double-track near the Pink Cliffs of Dixie National Forest, Utah has some amazing places for an adventure on two fat wheels. If you are new to the state and haven’t yet explored Utah’s trails, this is the summer to start. If you haven’t yet tried mountain biking, please read on! I will acknowledge that mountain biking can seem like an intimidating sport. Mountain biking often has a macho reputation. With terms such as “shred,” “endo,” “gonzo” and “attack position,” it can seem like a sport only reserved for “gnarly” dudes. I really think though, that guys like to make it seem tougher than it really is. If you can ride a bike on the street, you can learn how to ride dirt roads and the great singletrack trails of Utah. There is a learning curve to be sure, but with some skilled instruction, novices can soon be enjoying fat tire fun and actually look forward to encountering obstacles on the trail. As with any sport, the mastering of some technical skills will make it more fun as you enjoy riding twisting alpine trails and someday take on our Mecca of mountain bike rides, the Slickrock Bike Trail. Where to start? Cycling clubs (see our club guide online at cyclingutah.com) and especially mountain biking clubs are also great sources and some offer skills clinics. Many of Utah’s ski resorts offer their trails and lifts for mountain biking in the summer and several, such as Deer Valley Resort also give clinics and lessons for those who would like to learn mountain biking skills. Several bike shops around the state offer shop or group rides on local trails. Ask in advance if they offer anything geared toward new riders. Learning the technical skills of mountain biking can be especially intimidating to women, so some bike shops in Utah’s most popular mountain biking towns freely offer regular women’s rides. The women’s rides have a beginner-friendly and social atmosphere that makes them the shop’s most popular weekly rides. The Moab/Canyonlands area has the most famous rides in the country, and for good reason, they offer stunning and unique vistas and rides that challenge even the experts. To get away from the crowded popular trails isn’t hard, if you know where to go. Moab’s bike shops offer not only bike rentals, but will freely give advice on new places to go and trails to try. Various touring groups in Moab such as Magpie Adventures, White Rim Tours, Moab Adventure Center, and other s offer novice friendly guided tours and lunch as well for a fee. Hurricane, surrounded by miles and miles of great singletrack and nestled alongside the famous Gooseberry Mesa and not far from Zion National Park, has been called “the next great slickrock biking town” by National Geographic’s Adventure magazine. Among the water-carved red sandstone and craggy mountains surrounding Hurricane, visitors can find world-class mountain biking trails. Novices can run through their technical skills on the slick rock of the north rim of Gooseberry Mesa and experts will enjoy the challenges of the south rim. In addition to Gooseberry Mesa, check out the Little Creek trail’s mix of singletrack and slickrock. Finally the J.E.M., Gould’s and Hurricane Rim trails are each terrific in their own right, but together can form 21-mile loop of singletrack that Bike Magazine called one of the best in the U.S.
Park City’s trails don’t dry out for mountain biking until late in May (and this year, maybe a bit later), but they are worth the wait. 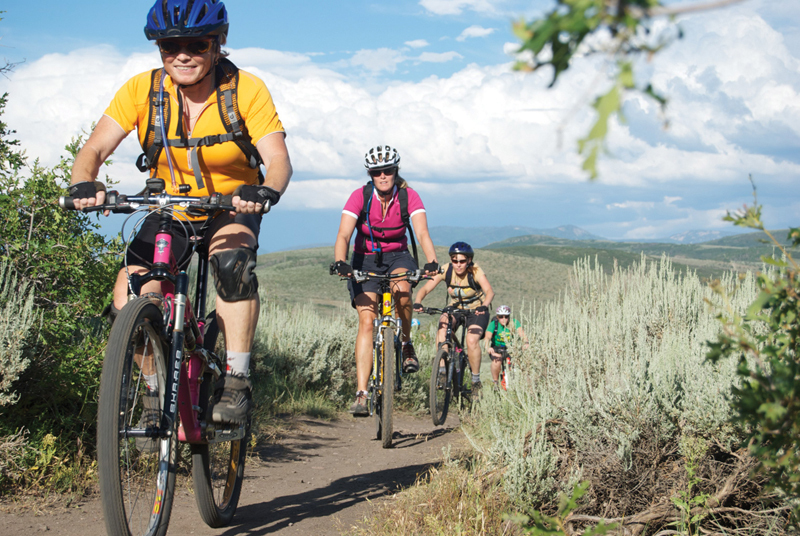 Park City offers not only a high altitude respite from the summer heat, but over 400 miles of trails. The trails around Park City include both mellow family-friendly trails and high-caliber singletrack. Its terrain varies from the virtually flat to punishing climbs and fast-paced doubletrack. Mountain bikers can take advantage of free public transportation that will take them along with their bikes into town or to a resort trail. 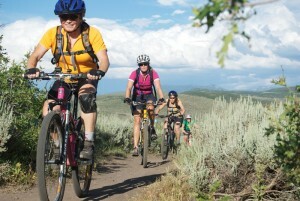 Trail maps are updated yearly and are available in all Park City bike shops. From our June 2011 issue.